The Sandbox Collective hasn’t even been in Manila’s theater scene for a full year, yet it’s already gained a huge following. I know I fell in love with their production of Dani Girl, which I reviewed for Hitlist.PH and watched again in a different venue. I’m no theater expert, but I do know what I like—actors who give raw, believable performances, music that draws me completely into that world, and most importantly, material that’s compelling, meaningful, and real. From what I’ve seen so far, The Sandbox Collective does an excellent job delivering all three. 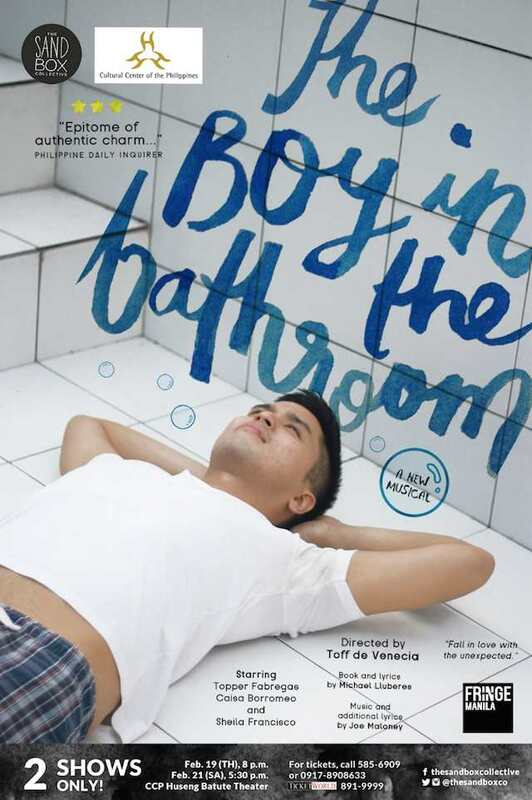 If you’re looking for a cool way to spend your Saturday, why not head over to the Huseng Batute theater at the CCP and catch The Sandbox Collective’s final showing of The Boy in the Bathroom? It’s an off-Broadway musical that touches on themes such as parent-child relationships, unexpected love, and facing the unknown. It seems right up my alley, and I regret being unable to catch it this time around. You could still watch it though—and you should! Read on for more deets about this show! Could you stay in one place forever? Or live day to day without knowing what’s out there? For David, staying behind closed doors seems to be the only option. Crippled by his obsessive-compulsive disease, a manic mother and his disillusionment with the world and life in general, he isolates himself in the bathroom for a year and vows never to go out. That is, until he meets girl. In this quirky yet refreshingly sophisticated musical, one explores that exhilarating feeling of finding the answer to life’s questions, and taking that leap of faith. This quirky, Off-Broadway musical which critics have dubbed as “widely entertaining and yet hauntingly poignant”, explores the relationship between OCD-inflicted David and his overbearing mother Pam. In a singular moment, everything in David’s life comes to a halt as he locks himself in the bathroom, forging a world of daydreams, toilet paper, and make-believe. When a girl named Julie enters the equation, however, he finds himself falling in love and wondering whether it’ll be just enough to make him open the door and venture into the unknown. Fresh from its critically acclaimed showing at last year’s Imaginarium Festival, The Boy in the Bathroom returns for a limited rerun this February as an entry to the upcoming Fringe Manila Festival. The much-anticipated restaging will take place on February 19, 2015 (8:00 pm) and February 21, 2015 (5:30 pm) at the Huseng Batute Theater of the Cultural Center of the Philippines. The musical stars Broadway World award-winning theater actor and Aliw Award nominee Topper Fabregas, Gawad Buhay Award-winning actress Caisa Borromeo, and veteran actress and star of West End, Sheila Francisco. The Boy in the Bathroom will be directed by Toff de Venecia, director of the award-winning musical hit, Dani Girl. Fall in love with the unexpected this February as The Sandbox Collective opens its second season with this heartwarming piece that goes right for the heart and soul. Catch a break. Take a breather. See the Boy in the Bathroom this February. For ticket inquiries, please contact 585-6909, 0917 8877 225, or 0917 8908633. Follow The Sandbox Collective on Facebook: TheSandboxCollective | Twitter: @TheSandboxCo | Instagram: @TheSandboxCo. Learn more about us here: www.thesandboxcollective.com to find out more about our shows, promotions and season line-up.